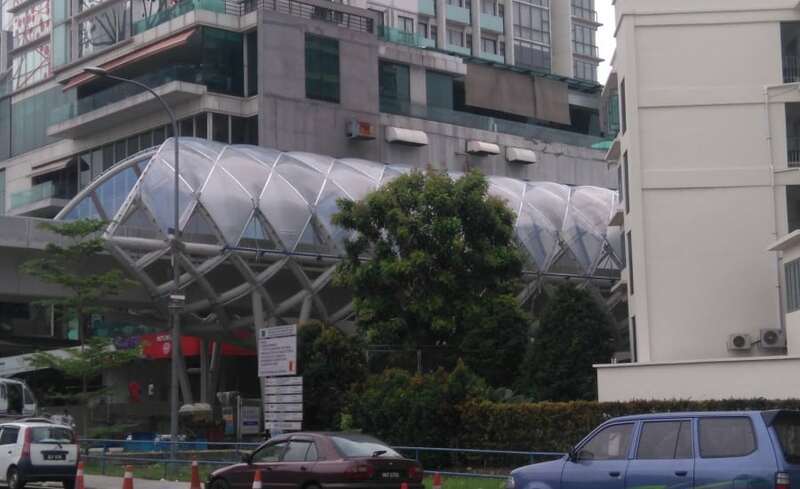 Billed as the country’s first “tunnel in the air” the Kelana Jaya LRT Line Tunnel, which opened in March 2016, is formed from ETFE cushions cladding to a twisted lattice of steelwork so Architen Landrell were thrilled to be appointed to design, manufacture and install the 2500sqm of ETFE cladding.. 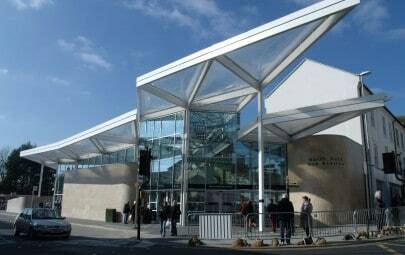 Designed by the architect to create a broken up surface, the cushions are a mixture of clear and printed with a heavy silver frit to produce a pattern across the cladding. In addition, the irregular form of the tunnel meant that no two of the 363no. ETFE cushions were the same; some differing by only mm but enough to mean individual analysis and patterning was required. 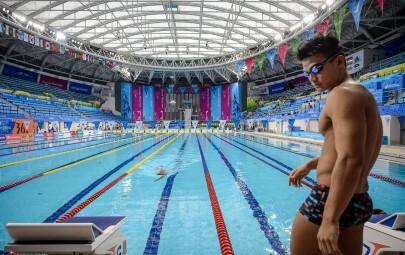 So why was the ETFE cladding used? 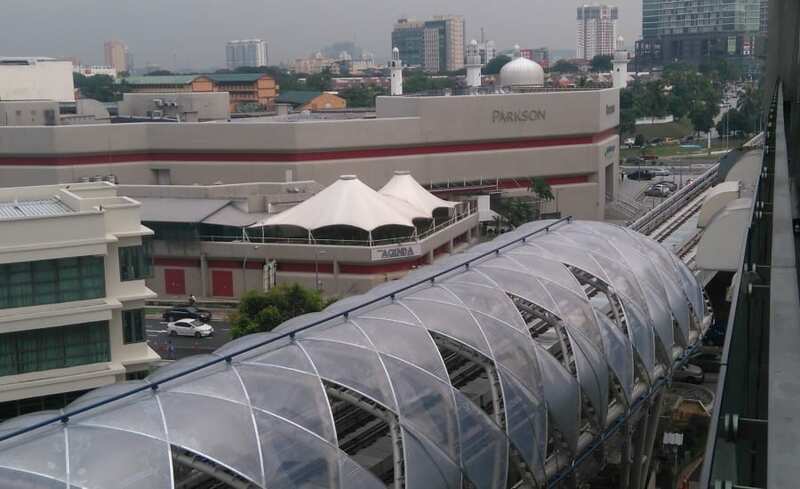 At points sitting only 2.5m away from existing buildings, the impact of the extension of the LRT railway line has to be carefully considered. The line itself passes directly between two existing buildings, a hotel and an apartment block, so there was a strong desire to protect residents and visitors from both the noise and view of an active train line. 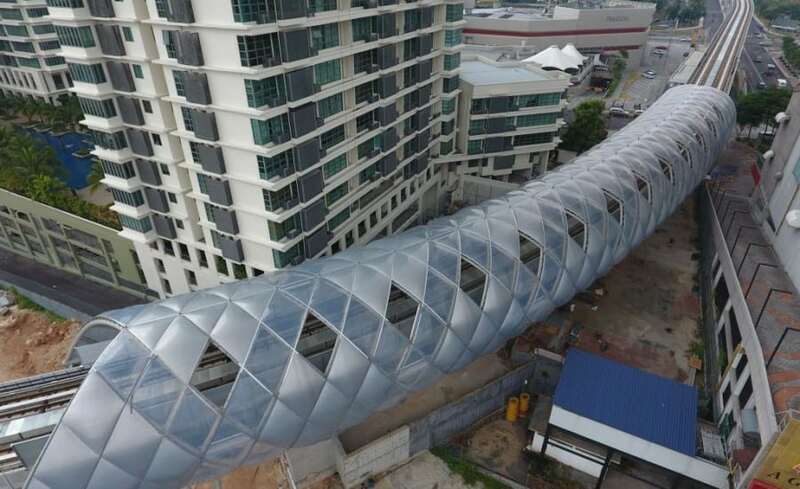 The tunnel, which is formed by a lattice of complex steelwork, supports acoustic panels alongside the track in order to give a level of absorption and the ETFE cushion give partial visual obscurity from the railway line to the hotel/apartment. 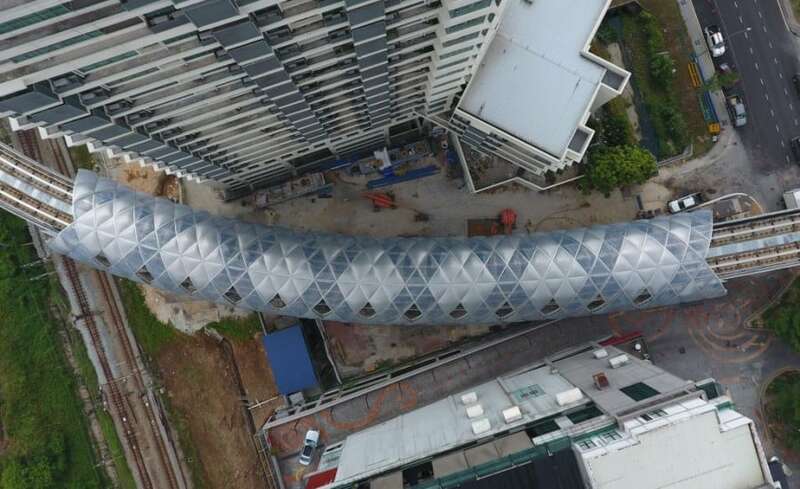 In addition, the tunnel provides an stunning architectural feature which can be viewed from the ground and runs alongside one of the major trunk road into the city. 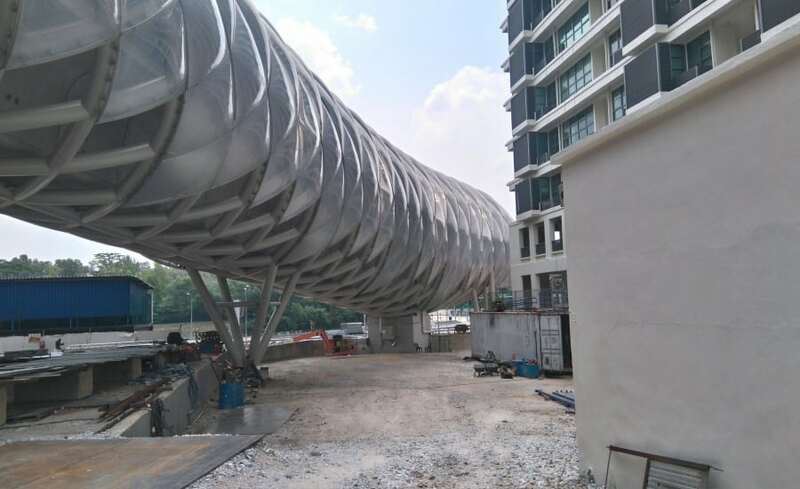 For a city that is home to miles of concrete railways lines situated above ground, the new Kelana Jaya LRT Line Tunnel is a welcome architectural work of art. 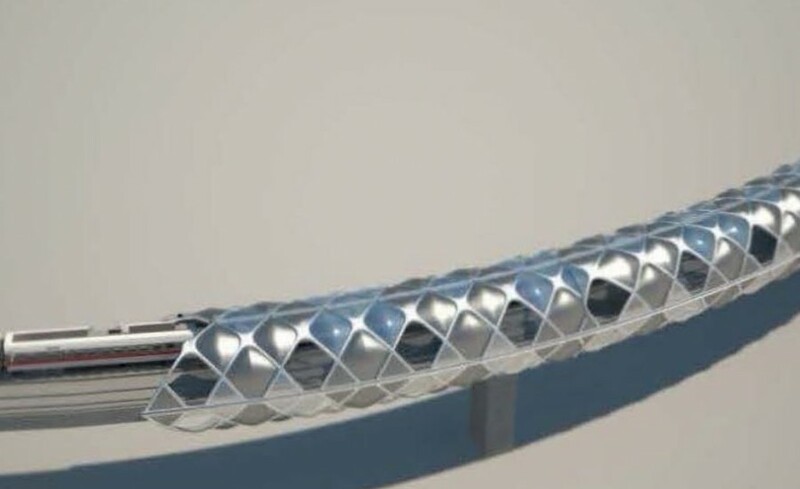 As an incredibly complex geometry where no two openings were the same, the precise fit of each and every ETFE cushion proved the biggest challenge to overcome. Faced with 363 different cushions to analyse, pattern and frame, we knew we needed to approach this from a different direction to our average project. In order to streamline the work involved we worked with a computer programmer to help us to develop software which could output the cut files and extrusion details for every single cushion. This approach meant hours of manual work could be bypassed and it allowed us to incorporate changes quickly and easily without the need to re-draught designs. Installation was also complex as the railway line was being commissioned and became active during our installation phase. Using a gantry positioned on the outside of the steel frame, The ETFE track, pipework and cushions were all installed from above whilst trains regularly ran through the tunnel beneath. We’re thrilled with the results of the project and the overall impression of the tunnel is extremely effective. 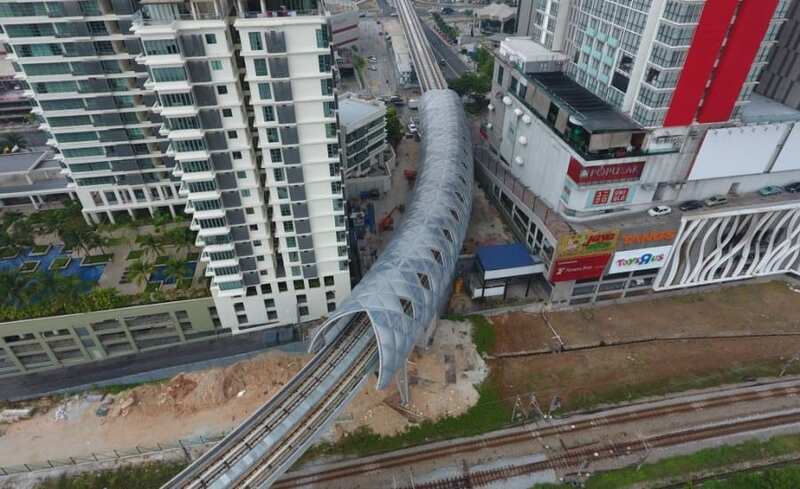 Public reception to the tunnel in Kuala Lumpur has been good and we can’t wait to ride the LRT ourselves to experience this architectural artwork ourselves! 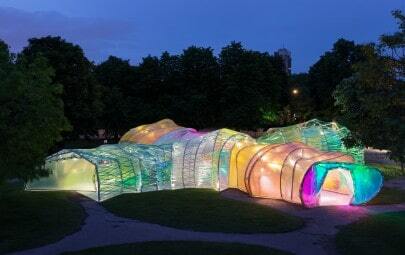 ETFE Foil Cushions – What Do You Want to Know?